Acquired: Selected in the fourth round, 27th overall, in the 2016 CFL Draft. 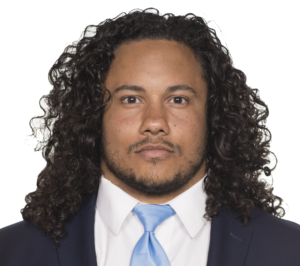 2018: Started all 18 games as a fullback/tight end for the Argos. Caught 30 passes for 242 yards and a pair of touchdowns. Set a career high with 55 yards against B.C. on October 6th. 2017: Played in all 18 games, started eight. Had a career year with 36 catches for 366 yards and five TDs. Playoffs: Caught one pass for 15 yards in East Final against the Roughriders. 105th Grey Cup: Made five catches for 36 yards including a pair of two-point conversions in the win over Calgary. 2016: Played in all 18 games. Caught two passes for 17 yards, adding a half-dozen tackles on special teams. The Oakville native made his CFL debut Week One against Hamilton, and his first CFL catch was against the Ticats in Week Eleven. College: Played four seasons at McMaster. Carried the ball 18 times for 118 yards and two TDs. Caught 21 passes for 107 yards and a touchdown. Was a member of the 2012 Yates Cup championship team. Personal: Attended Holy Trinity Secondary School in Oakville, Ontario. Was active with the Argos in the community during the off-season.